Can you believe that Easter has come and gone, and we have had Daylight Saving Time for almost a month? Just because there are more daylight hours and the weather is getting warmer, don't put away that needlework you are working on. July judging will be here before you know it! Don't forget our members-only contest. We are again having a Dress-A-Doll Contest. The doll will be judged only by how it is dressed. Knit, crochet, or sew something- no ready-made clothes. Dolls will be judged in Cheshire on July 23rd. You can have your doll back after display on July 24th. It would make a nice Christmas gift. Another members-only special craft contest is making a scrapbook. It may be any size, any subject, and any design- only one book per person. All entries will be returned to the maker. Judging is in Cheshire. We are still collecting for the Foster Families. Anything you have done before for them may be done again. Leftover yarn makes great comfy covers. Christmas stockings or gifts, school supplies, and memory books are always welcome. Perhaps your Grange could get together and purchase gift cards for children. If too much of one item is received, we will share it with Covenant to Care, Inc.
For Covenant to Care we would like to have a baby shower of gifts for infants and toddlers. Any suitable baby item would be very welcome. Please bring items for Foster Families and Covenant to Care to State Session in October. Don't forget the New England Grange Building Country Store. We need all kinds of handmade items to sell at the Big E. This building helps to keep the Grange visible to others. We haven't forgotten the Junior Granges. A special project called "Nifty Needles" is part of the needlework contests just for them. Any item knitted, crocheted, or sewn may be entered. Juniors may also enter the baking contest using the same recipe as the adults. 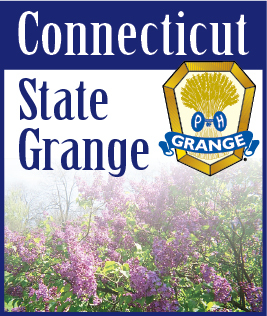 To show off the Grange, let us all have many entries in our contests! Keep those needles clicking. Your CWA has entry forms.